Q. 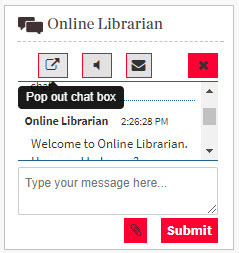 How can I use the pop out feature for the Online Librarian chat box? The Online Librarian chat box is too small. Is there a way to resize the chat box? There is a pop out feature you can select once you are connected with the Online Librarian. 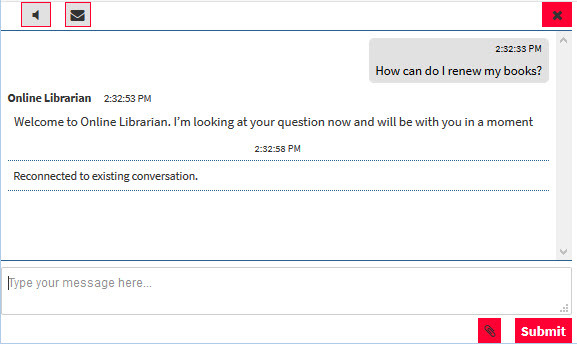 You may notice that you will not be able to continue the chat conversation in the embedded chat widget as the 'Type your message here...' box will be greyed out, so you will need to continue your conversation with the Online Librarian in the pop out box. How do I send a copy of a chat transcript to myself?